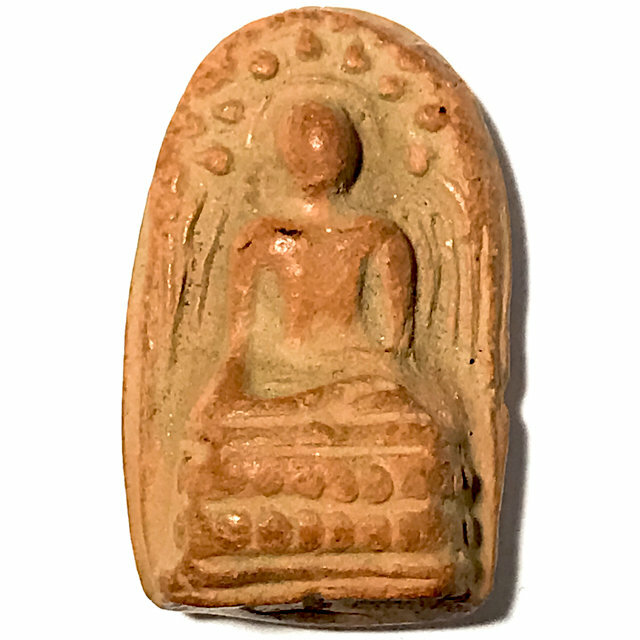 A rare early era amulet of the great Sak Yant Master, Luang Por Guay, of Wat Kositaram in Chainat Made from Muan Sarn Sacred Powders and Baked Earthen Clay, with thumbprint on rear face, from the hand pressing method used to create Benjapakee Clay amulets according to the Dtamra.The Pra Pim Pra Kong Luang Por Guay is a highly preferred Pim (Pim Niyom) of the pantheon of amulets of Luang Por Guay. This particular exhibit is Ongk Kroo Pim Niyom Master-Class exhibit, notable for its pristine condition and clear features, and its immense aesthetic beauty. A rare chance for a rare amulet for true Devotees of Luang Por Guay, for Bucha, and blessings of Maha Lap, Metta Mahaniyom, Maha Pokasap, and Serm Duang. The Pra Kong is made from reddish earthen clay, which reveals its early era status from the hardened and smooth surface features, and the deeply ingrained 'Kraap Kru' residue which is stuck to the surface on the recesses of the relief of the amulet. The factose of dryness through natural aging, porosity-density ratio, and the smooth dense hard surface of the most protruding features, add up to make this Pra Kong Lampun Luang Por Guay Wat Kositaram a definite 'Pra Niyom' Master Class amulet, which any devotee would be proud to wear and pray to, and would feel extremely confident to present this exhibit in any competion, and win a prize with it. The rear face has visible thumbprints from the manual pressing of each individual amulet, which is of course a method which results in each amulet having slightly different appearance, due to differing pressure of the hand on the block press. This exhibit has beautiful features, and its rear face contains all of the visual criteria (Nuea Ha), of a Pra Niyom class amulet. The Thai Number 5 is inscribed on the base of the amulet.